A trend towards decentralized systems of government and the strengthening of subnational governance is underway globally. However, decentralization has many different meanings, and it is frequently left undefined, even while it is being implemented. This chapter argues that enhanced understanding of concepts and theories can contribute to improved practice during decentralization reforms, and consequently be of benefit both to governments and their citizens. Drawing on the theoretical, research and public administration literature, an approach is adopted that aims to inform decentralization praxis, that is, the interplay of policy, strategy, implementation and review. The material is used as a foundation for presenting a synthesis-framework for praxis that draws attention to: appreciating the theoretical scope of fiscal decentralization; focusing on the country and its goals; considering the design of the system of multi-level governance; focusing on central and local capacity; and adopting flexibility, supported by feedback mechanisms, in the process of decentralization. “Decentralization” is both a structure and a dynamic process that relates to questions of authority, responsibility, and power, as well as to the functions and resources, of different levels of government. Arguments in favor of decentralized systems of government focus on the role they have in making governments of nation-states more efficient in the provision of public goods and services (Letelier-Saavedra & Sáez-Lozano, 2015; Rodriguez-Pose & Ezcurra, 2010). The central economic value of multi-level government is considered to be its ability to improve allocative efficiency (Oates, 2005). It is argued that decentralization allows for more effective and inclusive decision-making (White, 2011), reduces the distance between bureaucrats and economic agents (Buehn, Lessmann, & Markwardt, 2013), and may also be able to enhance economic growth (Martinez-Vazquez & McNab, 2003). Decentralized governments are seen as being more responsive and accountable to the citizenry by enabling government to perform closer to the people it is meant to serve (Kwon, 2013), thereby improving public sector performance and democratic accountability (Pina-Sanchez, 2014). Efficiency, responsiveness, and accountability to the citizenry are presumed to enhance the legitimacy of government authority through promoting the welfare of individuals and communities. A global trend towards decentralization is evident over the past few decades (Sepulveda & Martinez-Vazquez, 2011). At the same time, many different meanings are assigned to the concept, and it is frequently left undefined, even while it is being implemented (Dubois & Fattore, 2009). This chapter1 argues that enhanced understanding of concepts and theories can contribute to improved practice during decentralization reforms, and consequently be of benefit to governments and to their citizens. Decentralization has also been an aspect of public policy and administration enjoying international research interest, and this chapter reviews this growing evidence base, focusing on what has been learned about the both the complex processes and the multifaceted impacts of decentralization. In the search for research literature, the emphasis was on large-scale studies that adopted cross-country and longitudinal research designs, and quantitative analysis. Drawing on the theoretical, research and public policy and administration literature, an approach is adopted that aims to draw benefits from this literature for public policy and administration. 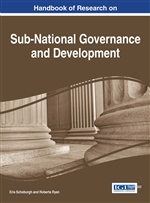 The material in the chapter is used as a foundation for presenting a synthesis-framework for decentralization praxis (policy, strategy, implementation, and review) that draws attention to: appreciating the theoretical scope of fiscal decentralization; focusing on the country and its goals; considering the design of the system of multi-level governance; focusing on central and local capacity; and adopting flexibility, supported by feedback mechanisms, in the process of decentralization.